Author, editor, writing coach and spiritual counselor Noelle Sterne has published over 300 pieces in print and online venues, including Writer’s Digest, The Writer, Women on Writing, Funds for Writers, Children’s Book Insider, Transformation Magazine, and Unity MagazineIn her book Trust Your Life: Forgive Yourself and Go After Your Dreams, she draws examples from her academic consulting and other aspects of life to help readers release regrets, re-label their past, and reach their lifelong yearnings. Q: Tell us about your personal and professional journey as a writer, along with who or what encouraged you along the way. In the likely apocryphal story my mother loved to repeat, I stood up in the crib at 4 months old crying not “Momma, Momma” but “Book-a! Book-a!” I don’t remember this. But like so many other writers, I started early. I still have, from my productions at about age 10, crumbling black three-ringed notebooks, 7×10”, filled with lined pages of painstaking handwritten poems and stories. These notebooks proliferated, graduated to file folders, and now to magically stored computer files with gigantic gigabyte capacity. From my earliest consciousness, the desire to write has been an inner drive, a necessity, a deliciousness, ever unfinished business. I write to share the wisdom that comes through me. To let others to see and feel through me. To capture the essence of what I marvel at, what moves, fascinates, and intrigues me. To touch others with universal feelings and truths. In my professional journey, like almost everyone else, I’ve got a wall-lining collection of rejections. I continue to explore new avenues for stories and short pieces on writing craft, writing motivation, and spirituality—ezines, blogs, the few remaining print magazines. As an adult, when I share my dreams and struggles with my few good women friends, they are extremely supportive. My husband, though, is my most constant supporter. He critiques my pieces honestly, provides a wider perspective (rejection remedy), gives me the alone time and freedom I need, and makes great salads. Q: What was the “aha!” moment that inspired you to start writing Trust Your Life? The moment was rather a succession of moments. First was in my coaching and editing practice assisting adults who return to universities for dreamed-of graduate degrees. No matter how impressive their accomplishments and titles, they often lamented about lost time, feared they would never finish, and voiced destructive perspectives that impeded their progress. Editing their dissertations, I also found myself reassuring them that they indeed deserved to reach their dream, at whatever age. In the process, I developed many steps for helping them, and the experiences formed a major impetus for the book. The second “moment” was my quest of my own dream. Like clients, I was battling the same doubts and fears about deserving to reach my dream—writing my own work. Writing about achieving one’s dream was what I needed to learn too. Q: The title is wonderful – how did you come up with it? I wanted words that capsulate what so many of us feel about our lives. In an early essay that was the germ of the book, I persisted in not forgiving myself for past decisions –such as earning my own doctorate—and felt they were getting in the way of my dream. The title reflects the connection between trusting one’s choices, wherever they have led, and not judging them as misguided, wrong, or blatantly stupid. The second part of the title tells readers that it’s acceptable—no, necessary—to honor our inner guidance and secret dreams. And I am pleased that both titles are imperatives or, if you will, affirmations. Q: Who would you say is the target reader that will benefit the most from the universal themes and messages your book addresses? The second answer: Trust Your Life addresses those who want something that’s gnawing but they can’t yet identify, those who yearn for an often lifelong, sometimes outrageous pursuit they’ve never let themselves pursue. The book is also for those who want to increase what they’ve already discovered and may have embarked on. Readers include but are not limited to Baby Boomers, seniors, empty nesters, and retirees. Third answer (sorry to be so verbose): This book is for all of us who suspect we’re not living up to our potential but may not know what to do for solutions. Today more people are admitting that the great American credo of consumerism doesn’tsatisfy. The book shows readers how to turn from the chase after accumulation, despondency, lethargy, and fears to identify and activate the dreams they’ve denied. Q: In the preface you talk about the importance of trusting one’s inner wisdom. How do we know, though, whether it’s the voice of wisdom and our inner self guiding us to make smart decisions versus the voice of our head or our ego? The touchstones for me, and others, are first physical. For example, “I felt a lightness in my chest, a sense of completion, of everything dropping into place . . .” (p. 75). Later I relate the definitive answer of a member of A Course in Miracles study group: “It gives you peace” (p. 93). Then I expand: “The voice . . . is certain, calm and strong. It commands without censure and doesn’t waste words. Past all my nonsense, it centers right in” (p. 94). Q: Are there such things as irreversible wrong turns in life? No! Every turn is for learning. I go so far, with many others, and say there are no mistakes. In the larger picture, whatever the consequences (and they may have been rather severe by earthly standards), we have made no mistakes but rather have had experiences. When we look back on our experiences and reflect on the march of happenings from one person, event, or situation to another, we begin to see the line of synchronicity, connection, and purpose. In my own case, the academic editing practice helped me in my own writing to write better, longer, sharper, and with more discipline. As writers, we may recognize the synchronicity: Haven’t you experienced something you thought had nothing to do with writing, or chose to do something you felt was a waste of time? And then . . . a day, week, month, or year(s) later you use this experience in your current work? So, a major premise of this book is this: There are no mistakes. Even if you can’t immediately see the sense, your life experiences prepared you perfectly for where you are now. Nothing was wasted. Q: Do you believe in destiny or choice? I believe in choice. More radically—we choose, on a conscious or unconscious level, everything that “happens” to us. I refer readers to a piece of mine on this topic in Inspire Me Today:“We Are the Creators of Our Lives” (http://inspiremetoday.com/brilliance/we-are-the-creators-of-our-lives/). Q: Have you ever taken a leap of faith? Every time I sit down to write I take a leap of faith. I leap knowing I will be given the right ideas and words. I love American poet Richard Wilbur’s command: “Step off assuredly into the blank of your mind. / Something will come to you” (“Walking to Sleep,” lines 3-4). Another very large leap: In deciding to move to Florida (for many pleasant reasons) from New York City, my husband and I worried, I mean, wondered about missing the city’s energy. A wise spiritual teacher advised us: “You take your consciousness with you.” As we took the leap, we have discovered many like-minded people and relationships, personal and professional. Q: What’s your definition of spirituality? Spirituality is recognizing we are spiritual beings on a material journey. Listening and surrendering to our inner guidance. Not solely following externally imposed precepts or faithfully attending church. But we can be religious and spiritual at the same time. Many spiritual/religious movements recognize our inner guidance and meditation. Spirituality expresses in many forms, especially with a good heart. Q: If you could add an extra commandment to the existing ten, what would it be and why? Thou shalt listen inside to your Inner Guide, which always steers you right. Q: What about people who live in constant denial of their dreams, be it a mindset of unworthiness or a skeptical view that the dream is impossible? Is that repeated state of denial doing more to jeopardize their physical and mental health than they realize? Denial of our dreams can indeed result in physical and mental health manifestations. In Chapter 3, I talk about this and refer to spiritual teacher Louise Hay’s valuable chart of body-mind relationships. Many others today, thankfully, have added to our understanding, such as Drs. Larry Dossey and Bernie Siegel. Whatever we deny in ourselves, resent, say yes to when we know we should say no (and vice versa), is reflected in our bodies and our outlooks. Denial breeds anger, resentment, frustration, and self-hatred, and we become depressed and joyless. How can we then pursue our dreams? Q: So how do we retrain ourselves to generate more positivity in our lives? First, with affirmations. A wonderful way is in Emmet Fox’s The Golden Key: whenever a negative thought strikes, think of God instead. Period. Second, with meditation. Daily meditation is a discipline in itself. Our “drunken monkey mind” relentlessly tries to take over, but the discipline is in sitting there and repeating a chosen meditation phrase or following our breath. Eventually the sabotaging mind quiets down and slinks away. Third, people we associate with. Surround yourself with positive people, not the emotional leeches and “crazymakers” (Julia Cameron, The Artist’s Way, p. 44). Notice how you feel after meeting or spending time with someone. Rejuvenated? Refreshed? Or depleted? Headachy? There’s your answer. Q: The theme of forgiveness figures prominently in Trust Your Life. Why is the practice of forgiving not only those who have hurt us but also forgiving ourselves such a critical component of dream fulfillment? Forgiveness is crucial for our outlook, attitude, perspective, perceptions, and projections (that should cover it). Not forgiving, we’re angry and tight, holding onto old hurts like a favorite childhood doll. We’re using our energy to fuel our resentments and proud rightness. These emotional and psychological activities leave us little for thinking creatively and proactively to pursue what we really want to do. As we forgive even one person, simultaneous miracles occur: We find it easier to forgive our sister, our parents, our boss and coworkers, and even ourselves. Q: Why is anger such heavy baggage for most people to unload? When we’re angry, we think we’re right. Underneath, we also feel hurt and rejected. Anger is also a way to control others and get their attention. For such reasons we hold on—to hurts, slights, insults, betrayals, wrongs, angers, resentments, annoyances—through months, years, decades, and, before we blink, a lifetime. You know the stories—maybe you have one—of brothers estranged for 25 years over an argument they can’t even remember, or mother and daughter who exchange only frosty greeting cards at Christmas. The anger is heavy baggage because we usually find it hard to put aside our pride and say, “I was wrong” or “Please forgive me.” As we are able to, we’ll feel a great lightness and rush of love. Q: Do you think the world in general is becoming more spiritual or less so? Much more spiritual. This book’s popularity, and that of many other spiritual books, attests this. Also, in the field of writing, more publishers and agents are now calling for books in the genres of “New Age,” “Spiritual,” “Metaphysical.” They wouldn’t touch these a few years ago. Spiritually-based blogs and magazines continue to appear. And great teachers like Deepak Chopra and Wayne Dyer are almost household words, and with television specials. Too, more people are seeking spiritual resources of all kinds. Articles in mainstream magazines and the Internet feature meditation and intuition-following. Yoga has become widely accepted. Recently, three spiritually-oriented movies became box-office hits— about Jesus, belief in God, and the afterlife. That’s a major shift from the usual action-adventure-thriller-CIA-aliens-monster movies. Next: to continue to spread the messages of Trust Your Life. I want to help people realize they are in control of their lives and have the power to build their lives as they wish. Next again: I am working on Trust Your Life’ssequel: Competition Therapy: Conquer Your Envy Of Others Who Are Where You Think You Should Be. Spiritually based, this book attacks the notion that if you’ve got it, I can’t get it. Next again: I continue in the academic coaching and editing practice, which gives great satisfaction in helping clients grow and achieve their dreams. From this practice, I am working on a book helping doctoral students their dissertations, the last and possibly most agonizing hurdle. This book addresses students’ largely overlooked but equally important nonacademic difficulties and is possibly the first to do so in depth. The title: Challenges in Writing Your Dissertation: Coping With the Emotional, Interpersonal, and Spiritual Struggles. Next finally: Other works perpetually in progress and stages of publication, including articles on spiritual and writing craft topics, personal essays, and several novels in various stages of sprouting. Readers are invited to visit my website, www.trustyourlifenow.com, which has an excerpt from the book and other works. 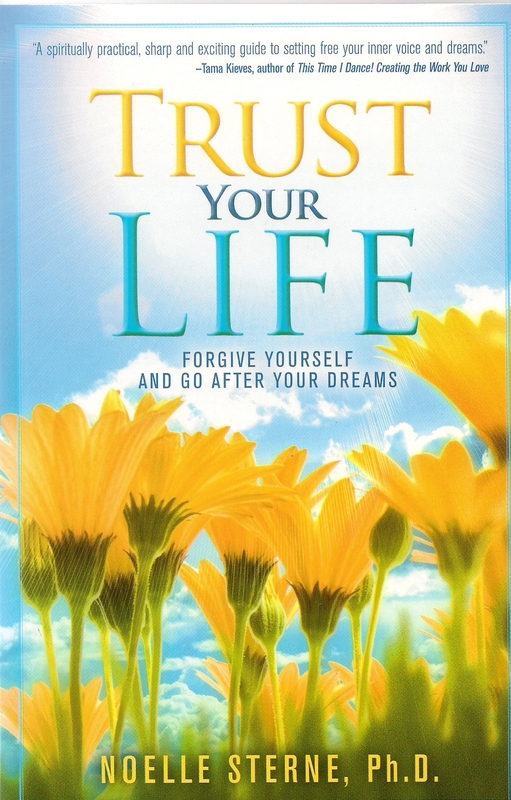 Trust Your Life in paperback and ebook is available on Amazon and other sites. A great thank you to you, Christina. You are doing wonderful work in so many areas. And for all readers (including myself), I add this: Start or keep meditating. Listen to yourself. Trust yourself. Dare to be what you know you are meant to be. It is never too late. You deserve a wonderful, satisfying, fulfilling, contributing life.